With 356 acres of permanently conserved land, including spectacular views of Crescent Lake and trails to suit almost all ability levels, Raymond Community Forest is one of the hidden treasures of the Lakes Region. For the very first edition of my summer series reviewing local hiking trails, I set off with my seven-year-old and four-year-old assistants to explore Raymond Community Forest. We’ve already thoroughly enjoyed the 1.1 mile Spiller Homestead Loop, so this time we packed backpacks, slathered on the bug spray (it is May, after all), and decided to tackle Pismire Bluff Trail. Pismire Bluff Trail is a 0.7 mile in-and-out or up-and-down, trail to the height of Pismire Bluff. The trails in Raymond Community Forest are impressively well maintained and well-marked, and the Pismire Bluff Trail is no exception. It begins following the Spiller Homestead Loop’s pink trail blazes from the parking lot, and then veers off to follow blue trail blazes across Conesca Road. I did spot some poison ivy near the parking lot and road, so make sure you stay on the trail as you explore. quarter of a mile. This section of the trail includes a few steep sections and one large set of stone steps. Although my assistants clambered up the giant-sized steps with utter delight, this adult was left panting for breath. The upper section of the trail includes a moderate 0.3-mile meander through a gentle forest, where we spotted several chipmunks and heard what sounded like hundreds of songbirds. 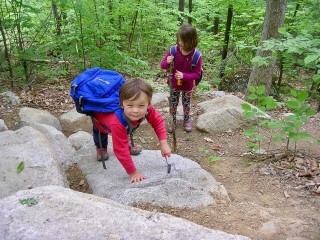 However, by this point in the climb my youngest assistant had a hiking meltdown and needed to be placated with M&Ms. Parents hiking with small children, be prepared! At the top of the bluff, a lovely wooden sign marks the turn for the Highlands Loop, an orange-blazed 0.7-mile trail also maintained by Loon Echo Land Trust. This looked enticing, but it was a bit too much for the four-year-old. Instead of exploring Highlands Loop, we followed the last 0.1 mile stretch of Pismire Bluff Trail to a lovely scenic overlook, where we watched water-skiers on Crescent Lake and a turkey vulture circle just overhead. (No, the vulture wasn’t for me; I swear I wasn’t that winded!) With a large, glacially-polished granite boulder and no cliffs in the immediate area, this overlook is the perfect place to stop for snacks after the climb. 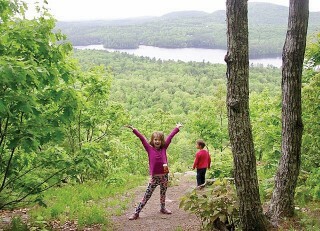 Once we’d finished our descent back down Pismire Bluff Trail, which went very quickly with lighter backpacks and the promise of an ice cream cone if we managed to make it back to the car without another meltdown, I asked my young assistants what they thought of the hike. Conesca Road. The trailhead for Raymond Community Forest is just past Hancock Road.